Dehradun city is located in the northern part of India. It is the capital city of Uttarakhand state. The city is also famous as “City of Schools” & “School Capital of India”. Dehradun is the home of many reputed engineering colleges which imparts various specializations in the field of engineering. Students from all over the country come to this city to pursue higher education in engineering. The literacy rate of Dehradun is 84.25%, according to the 2011 census. 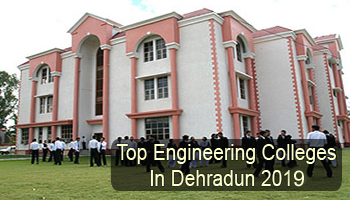 In this article, we have updated detailed information about Top Engineering Colleges in Dehradun 2019. Here, at savgyan.com, we have updated a list of the top engineering college in Dehradun including all the government & private institutions. We prepare the list after a complete analysis so that students can choose the best college for engineering education. All the listed institutions provide 4 years B.Tech programme in various specializations. The listed colleges are rated by our expert team on the basis of given factors such as college affiliation & approval, excellent infrastructure, student reviews, national importance, quality education, academic excellence, facilities provided by the college, etc. We have rated these colleges through a complete research & study. For admission to the engineering courses, candidates will have to appear in any one of the examinations, i.e. JEE Main, UKSEE & UUEE. Through JEE Main score, candidates can get admission in any of the engineering colleges located in Dehradun in B.Tech & B.Arch courses. UKSEE exam is organized for admission to the B.Tech (Lateral Entry) programme. Uttaranchal University also organizes an entrance exam known as UUEE for providing admission to engineering programme. Candidates, those wish to pursue M.Tech programme, they can apply for the GATE examination. Candidates can choose their specializations/disciplines as per their interest & scope in future. There are many universities which offer various engineering specializations such as Computer Science & Engineering, Information Technology, Civil Engineering, Electrical Engineering, Mechanical Engineering, Electronics & Communication Engineering, Automobile Engineering, etc. If you have any queries about Top Engineering Colleges in Dehradun 2019, you can ask us by leaving your comments in the comment box.